In the Workshop: What is the importance of frame alignment and preparation? 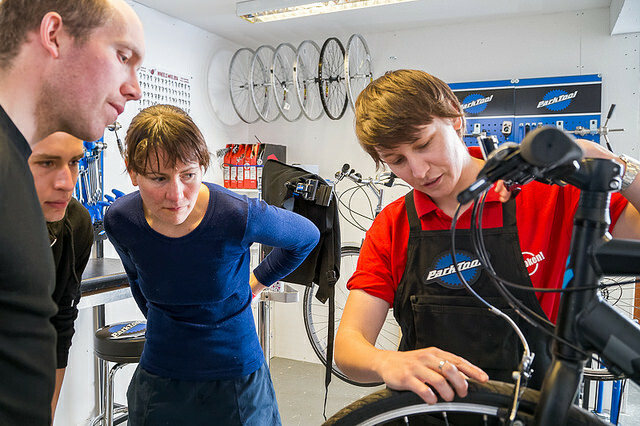 This week we’ve been talking to Catherine, Head Mechanic here at Outspoken Cycles, who explains why frame alignment and preparation is so vital when working on your bike, fitting parts and building bikes up from scratch. She also explains why it’s such an important module on the Velotech Gold course and what her top tips are for getting the job done. If you want a great riding experience and your components to last as long as possible then take some time to prepare your frame and check its alignment, it could save you hours of troubleshooting and possible rebuilding. If you are looking to become a mechanic in a workshop or a maintain a fleet of bikes that troubleshooting and rebuilding time will not only cost you valuable time but could impact your bottom line. Whether your frame is brand new from the manufacturer, or you’re looking to build up an old classic, it’s important to give it a good check first. Damage can often occur during the manufacturing process or in transit, or if it’s a used frame there’s always a chance it’s been crashed or damaged in use. Finding out that your frame is bent at the end of a costly and time-consuming build process is the last thing you want. So, what to check for? Check all around the frame for cracks and damage, especially around the welds and joins. Look out for peeling paint, just like a car this can be an early indicator of rust, corrosions or a dodgy paint job. Check that the frame isn’t bent. If you imagine drawing a line down the center of the bike as if you were sitting on it, you want to know that the right left and left are totally symmetrical. Ideally use a frame alignment gauge like the Park Tool FAG 2. If you don’t have access to the tools try Sheldon Brown’s String Method. Check and measure the spacing of your front and rear drop outs (the space where the wheels sit) is correct. Ideally check the drop-out alignment using the correct tool, like the Park Tool FFG2. Check that your rear derailleur hanger is not bent. The Hanger is the part that the rear derailleur attaches too. It can easily get bent if the rider falls off or the bike is dropped. Use a derailleur alignment tool, like the Park Tool DAG 2.2 tool. If you are buying a frame or bike and notice any of these issues raise a concern with the seller or manufacturer straight away. Once you are happy with the condition of the frame you can start to build up your bike, making sure that all the components you have bought for the bike are compatible (see our blog on issues of compatibility.) Some areas of the bike can be specifically prepped to allow correct and long-lasting fitting of components. Most of these preparations are designed to correct small imperfections during manufacturing or remove small amounts of paint that inhibit proper part fitting or to correct rust and corrosion issues. The seat tube can also be reamed to make sure the seat post fits correctly or because it is particularly corroded. Lastly be aware of your frame material and it’s specifications. Not all preparations are necessary or possible for all frames. Whether you’re riding steel, aluminium, titanium or carbon, this will make a big difference to the type of preparations you need to do and the choice of what greases and other preparation materials you use. So make sure you research your frame type and requirements before starting any jobs.